Currently, the two biggest competitor in Indian e-commerce space are Flipkart and Amazon. Amazon has already started accepting mobile recharges on their website. But, recently, Flipkart has also added the “Recharges” section on their mobile app. 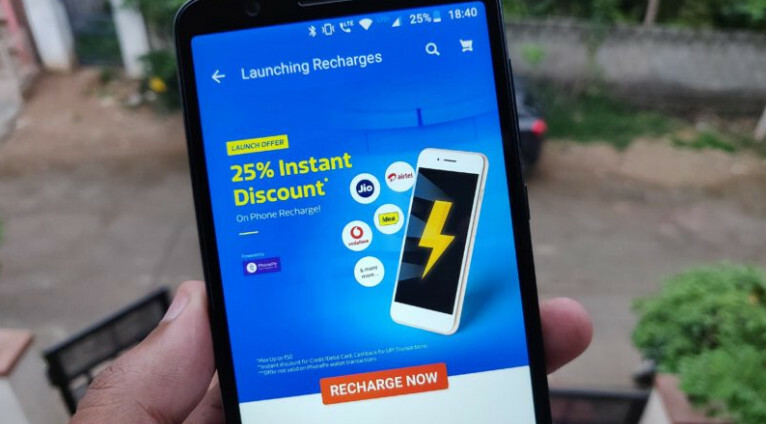 Users can now recharge their phone, DTH also using the Flipkart app. And as an introductory offer, Flipkart recharge offers 25% instant discount and 25% cashback on first time recharges. Just download and install Flipkart app on your mobile. Login to your account and go to the newly added “Recharges” section of the app. From there, you can initiate any recharge and pay the money online. Currently, Flipkart Recharge is offering flat 25% instant discount on first time prepaid mobile recharge. Just make the payment using credit or debit card through PhonePe option and you will get 25% discount instantly. On the other hand, Flipkart Recharge is also offering flat 25% cashback on first time prepaid mobile recharges, when you pay with UPI through PhonePe. Remember that, you need to make payment on the Flipkart mobile app only, but you need to select PhonePe as your payment method and then use your credit or debit card to get 25% instant discount or pay using UPI to receive 25% cashback. Both of these Flipkart Recharge offers will be available till 31st July 2018.